quality and experience is our strong plate! Euro Banqutes is the leading company in the organization of events in Patzcuaro, more than 15 years of experience support us. Our goal is to provide the best service to our customers covering all their needs with the best quality and the best service. Rental of tables and chairs for events, tablecloths in more than 80 colors, crockery, cutlery and cutlery, inflatables, lounge rooms, periqueras, lighted lane, awnings of all sizes, children's show, children's furniture, etc..
At Euro Banquetes we started our operations since 2001 and to date our clients continue to recommend us. Personal attention of its owner Claudia Corral Guizar, graduated and titled from the Center of Higher Studies of San Angel (CESSA) and the Culinary Institute of Latin America in Mexico City with experience in the field of more than 16 years. 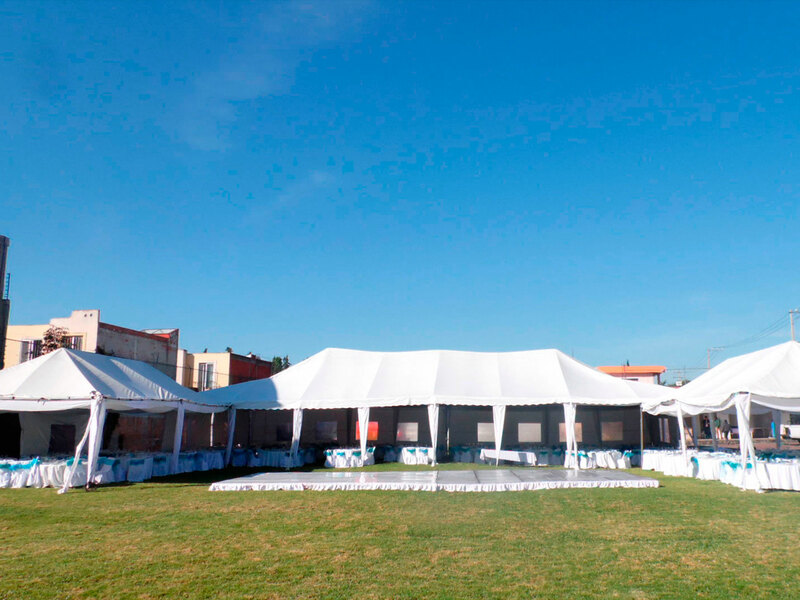 Mission: To be a leader in the market of banqueting services and rental of equipment for events in the Zona Patzcuaro and surroundings, with the best infrastructure to provide an efficient service that meets your expectations. If you do not know how to organize your event and you want to impress your guests, contact us and we will do it for you. Put the logistics of your event in the hands of professionals. We know the importance of that special day and what it means for you, for that reason we take care of the last detail. We have a wide range of furniture to make spectacular montages. Variety of chairs, tables of different types, luxury tablecloths, rooms, periqueras, candles, etc. You will find the best option to show your event with the widest variety of designs, bases and styles that will fit just what you are looking for. Ideal for outdoor events, it offers your guests comfort and elegance by covering them from the sun, rain or night mist. The balloons help us to give a fun and festive touch to our room, something that will certainly encourage the appearance of your event. It offers services of organization of celebrations and celebrations of different types, like weddings, XV years, meetings of businesses, children's parties and more. You will find a great variety of service such as rockolas, ice statues, chocolate fountains, inflatables, illuminated track, lounge and more. Maximum capacity of the room: 400 people and 65 children (additional in the children's room). Living room fully carpeted with cut crystal chandeliers. Contract for 6 hours (1/2 hour of reception of guests and 1/2 hour of eviction). Wardrobe for coats and sacks of the guests. Kitchen with work desks, grills and double stripe. Bar (freezer for ice, wine cellar with padlock and double wine glass for washing glasses). Individual bars per waiter with individual ice chest and trash can. 6 bathrooms for women with sanitary paper supplies, hand towels and soap all over the event. 2 bathrooms and 4 urinals for men with supplies throughout the event (toilet paper, liquid soap and hand napkin). In Euro Banquet we are interested in the satisfaction of our customers, Please write your doubts or comments and we will gladly contact you. Please write your questions or comments and we will be happy to contact you.